At the time I started collecting crystals everywhere I went I was told that I should care for them with some form of water treatment – ranging from cleansing them under running water, or flowing stream water, to soaking them in a bowl of soda water, or a sea salt both under sunlight to keep them cleansed and charged. Sadly these methods are still commonly recommended as techniques for crystals and these methods are often the worst thing that you can do in regard to caring for them. Exposure to salt can scratch the surface of even the hardest crystals, clouding them and decreasing both their clarity and their lustre. Some crystals are water soluble and can actually begin to deteriorate or fall apart if submerged under water of an extended period of time. Other stones will fade with prolonged exposure to the sun. To ensure that your crystals remain in good condition – it is recommended that you should at least consider some of the suggestions here. (the information on this page is copy written to myself and Stan Tucker - we created this document in 2012, and it does reflect some current updates, and is not in its original form). Your crystals are precious gifts from the earth and should be treasured. The first thing you should consider is how you are going to store them (particularly if you use them for metaphysical treatments). If you keep an assortment of crystals in a bag they may actually harm each other. Some of the harder crystals such as quartz, may begin to scratch and chip away at the softer crystals such as calcite, and tumbled crystals. If you intend to store your smaller crystals, or to travel with them, it would be wise to invest in a storage system that has compartmentalized sections with a tight fitting cover. You can purchase these at a craft shop. Storage systems with a clear cover are best as this enables you to see the contents without opening the box. Larger crystals and clusters when not on display or in use should be wrapped in a soft cloth and packed in bubble wrap in individual boxes or containers. If you are like me, and intend to travel with your crystals, - you would do well to wrap them individually in a soft cotton cloth before putting them into your pocket or handbag. Natural fibers do not impede the flow of energy and will protect their surface from other hard items such as keys that you may be carrying. If you choose to carry your crystals in a pouch- then you would do well to ensure that you don’t put hard crystals with soft ones, or better still – wrap them individually to protect them from each other. If you leave your crystals on display and out in the open – be sure to keep them out of direct sunlight. Crystals with vibrant colours such as amethyst, turquoise, fluorite, and rose quartz will fade in direct sunlight while other crystals may crack from temperature variations and fluctuations. Another negative impact on the openly displayed crystal is dust. If you rub dust off a crystal with a cloth – it can act as an abrasive and scratch and dull the surface. Should you crystals become dusty, hold it under running water, to clear it of debris, or use a blast from canned air spray (such as the ones you use to clean computer keyboards) – however, running water is my preferred option. To metaphysical cleanse a crystal is to assist it to maintain and maximise its inherent healing properties and potential. It is more than just a physical cleanse, and is more about removing any negative or unwanted energies that your crystal has absorbed. Consider your crystal to be much like a form of etheric sponge, where it absorbs “energy debris”. The crystals need to be cleared regularly and recharged. How you should cleanse a crystal depends largely on the type of crystal. If you are unsure of your stone's properties, there are a few methods that are safe for all crystals, as well as a few that should never be used. Many sources will recommend burying your crystal in a salt or sea salt to purify them – this is not a recommended option. Salt is a crystal itself and can scratch other crystals. When it becomes moist the salt can also be absorbed in to the crystals pores and dull the the surface. It is best to avoid having your crystals come into contact with salt if you wish to keep them in good shape. With my first crystal purchases I felt guided to let them recharge via the Mother Earth energy. Sometimes I still do. Burying crystals in the earth is good option, however it is also one that should be approached iwth caution. 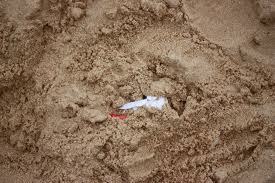 If you simply dig a hole and throw them in there are two risks here – one is that you will have them contact other materials in the earth such as stones and pebbles, and the other is that unless you clearly mark the spot – you may never remember where you buried them. Some people will recommend burying them in a pot of soft potting soil or peat moss from the garden centre - however, i feel that there is too much “ human energy” this way.. the peat moss etc has generally been handled quite a few times and is bagged. My preference is to wrap them in a cloth and bury them in a part of the garden where they can draw energy from the Earth Core. If you stick to putting them in the one spot and marking it – you never forget where you buried them, even if you feel the yen to leave them out for a week – you will know exactly where they are buried. (Remembering that this is not a good option for water soluble crystals – the potting mixture is probably best if you have allowed it to dry before putting your crystals into the mix). Most crystals can be recharged over night or within 24 hours however, follow your own intuition and inner voice in regard to time frames. Some crystals do love the sun – although not all of them. I find that i regularly feel the need to put crystals out under direct sunlight to soak up the energies. Clear quartz is one that responds well to sunlight, and is strong enough to withstand the heat. Given that sunlight can fade most crystals – its not recommended for all crystals.. however, it is still a practise that i like to do, I live in Australia, so I feel that the filtered sunlight under a veranda is enough to recharge the crystals if left out on the veranda for a few hours.. alternatively i may actually take them out from time to time and place them on a part of the lawn, in direct sunlight for an hour or two. I love to put my crystals under the light of a full moon – especially if it is raining. I find that this is a powerful cleansing ritual and safe for ALL your crystals. Once again – it would be wise to place them on a sheltered section of the veranda, or for the stronger type crystals such as quartz pendants – hanging them on a tree in the rain under the full moon is a wonderful option). (NOTE: NEVER put selenite or kyanite where they can be exposed to water). Incense is another fool proof method of crystal cleansing. Hold your crystal in the rising smoke of a cleansing or purifying incense (sandalwood, frankincense, sage, myrrh, cedar, white sage, and lavender are excellent choices). As you do so – ensure that your crystal doesn’t come into contact with the heat source. Lightening is great for removing stubborn energies attached to crystals. It is an extremely powerful cleansing agent and you don’t need to take it outside and have it struck by lightning to be cleared. During a lightning storm simply place the crystal on a windowsill or in a sheltered place outdoors. I have done this with my own crystals, as per my own guidance, I can't explain why however, I feel that the crystals enjoy the experience. It might be hailed as a great purifier – but seriously .. it is NEVER recommended for crystals. Don’t let your crystals come into contact with fire as they may crack or shatter. Some crystals however have been heat treated to enhance or to totally change the colour. (eg Citrine- deep orange, Tanzanite - Deepen the blue). A cleaning stone is a safe and easy option, and can also recharge your crystals. A purple amethyst Geode, is a perfect crystal cleanser, however, if you decide you want to use your geode or clusters for cleansing.. you will need to ensure that you wrap your other stones in soft cloth or protect the points of the geode..don’t place too heavy stones on the crystal.. and ensure that you protect the stone/geode/points from the other stones and clusters. If you cannot afford the cost of an amethyst geode for cleansing - the cheaper option would be a selenite log. I have both selenite and the amethyst geode. Selenite is multipurpose and never needs cleansing itself. I rest my jewellery and tumbled on selenite.